Do You Need To Remember A Bunch Of Passwords For All Your Online Transactions? We do a lot of stuff online. We send and receive email. We engage in social media. We have online banking transactions. We perform certain everyday tasks through staying connected. Staying connected means having more than a handful of accounts online and as many log in names and passwords. People usually have the same password for most if not all of their online accounts, but for more delicate portals such as payment gateways or online banking sites, it’s better to have a separate password that will be impossible for other people to crack. But it can become so difficult to remember all those login names and passwords, yet too risky to write them down or store them in one of your electronic devices. If only you could store all that sensitive information into one secure area, life would be a lot easier. RoboForm does just that. RoboForm is a software program that lets you store all your passwords in one safe location. All you need to remember is one password to unlock everything. 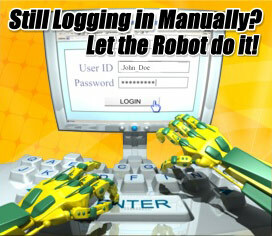 RoboForm automatically saves then securely enters all your usernames and passwords. With RoboForm, your logins and identities are stored into the cloud, making it easy for you to access them from any location and on any computer or mobile device. RoboForm runs on Windows, Mac, Linux platforms, Windows USB drives, and has apps for iPhone, Android and Blackberry. Out-of-the-box password management features that your employees will actually use and appreciate. Flexible, enterprise-wide implementation and administration. Portability – available to run from a USB Flash Drive. Click here to find out about RoboForm. Conforms to strict company password standards, policies and other authentication methods. Highly robust and scalable solution. Advanced identity theft and fraud protection. Secure, distributed architecture with no single point of attack. While having your information stored in an online resource may come across as an issue, you need not worry. RoboForm’s developer, Siber Systems, is a solid, reputable company that has been delivering software solutions to clients around the globe for more than a decade. RoboForm has garnered awards and positive reviews from a number of technology experts and publications.We’ve been using RoboForm for seven years and we’ve ever had any problems. All it has done for us is to keep vital information secure and increase our productivity. Buy RoboForm & Get My Free Bonuses. The fact is, my team and I love RoboForm so much and we know how much it’ll mean to you and your business that we want to give you a little extra incentive to go ahead and purchase. Now before you think this is just a cheap way to get you to buy through our affiliate link, hear me now… “I don’t really care whether you buy through our link or somebody else’s”. The fact is, RoboForm is an amazing tool that every internet marketer should have in their toolkit. Click here find out more and see what the bonuses are. These are 100% free to anyone who purchases RoboForm!